Summer is over and school is beginning (for my daughter) next week. Many students in my local community started school earlier this week. After taking taking a break myself for the summer, I am again hopeful that I will have a new post weekly. To assist me in planning blog posts, I created a mind map. A mind map is a visual diagramming technique. Also known as spider diagrams, mind maps typically center around a single key word, with topics extending out from that word. Subtopics are created from each topic. The term "mind map" was coined by Tony Buzan in the 1970s, and his company provides training and software for mind mapping. Mind maps are useful because information can be captured in a non-linear fashion. In traditional outlining, topics and subtopics are listed down the page. Inserting an additional topic in the center of the outline requires reformatting or rewriting. However with mind maps, it is easy to draw in a new area of information. Because mind maps typically consist of words connected by lines, they are inherently visual. In addition to the text and line structure, photos and drawings may also be included. Subtopics in different topic areas can be connected with dotted or different colored lines. All of these elements combine to make mind maps highly visual. Mind maps can be drawn quickly by hand, or with a little of practice, electronically. 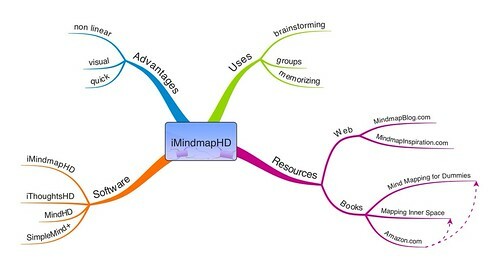 Several computer-based software packages exist for mind mapping. The ones featured in this post are for the iPad. These work on the iPhone as well, but the screen is rather small to be functional. The mind mapping process lends itself well to brainstorming. As you identify topics, you can draw them onto the mind map. Even while adding topics, you can add subtopics. The non-linear structure means that you can start with one topic but quickly move to another topic as ideas come to you. Mind mapping is effective as tool for individuals and groups. Groups like the mind map format because multiple ideas can be added simultaneously. You could also identify topics and divide into smaller groups to expand each topic. Because of the visual nature of mind maps, it is a convenient way to memorize information. For me, I find that when I mind map information, it is easier to recall. 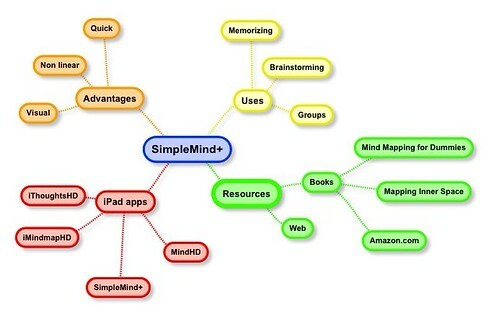 I currently have four mind map applications installed on my iPad. Each has advantages and a range of features. Depending on the look I want to achieve will determine which app I might use. For example, MindHD lists subtopics in neat blocks, while iMindmapHD looks more artistic and organic. 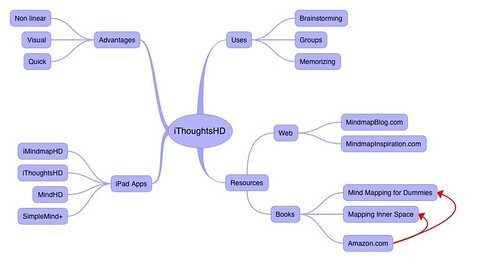 The mind map for this blog post is replicated using these different apps. At the time of this writing there are 72 mind map-related apps in the search results for iPad. iMindmapHD from ThinkBuzan is free to download. The full version is subscription-based with a monthly fee of $2.99 or annual fee of $20.99. SimpleMind+ from xpt Software & Consulting is free to download. The free version is limited. The full version can be unlocked for $4.99. MindHD from AllTing Soft is $.99. iThoughtsHD from CMS is available for $9.99. Amazon.com features a variety of books on all aspects of mind mapping. 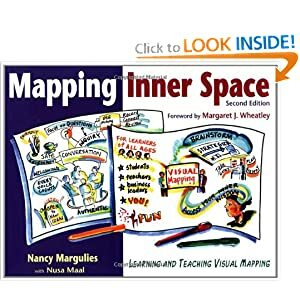 One that I reference frequently is Mapping Inner Space by Nancy Margulies.